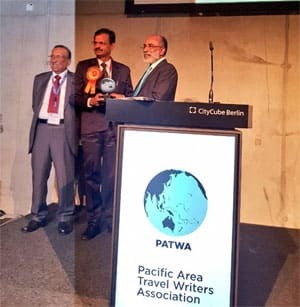 Palace on Wheels has won the PATWA (Pacific Area Travel Writers Association) award under the category "Tourist Train of the Year". The award ceremony was conducted in the ITB Berlin event in Germany. The world-renowned Palace on Wheels week long journey is a lifetime. Guests are treated to world class facilities alongside ambience of the Kings and Rulers of ancient times. Very similar to its name as Palace on Wheels has mesmerizing interiors and specialized hospitability. Feel treated like a King or Queen onboard. Several leading TV channels including Discovery, National Geographic, MTV, BBC, and ZEE TV have given coverage about the Palace on Wheels in multiple TV shows. World Travel Awards (WTA) recognizes brilliance over the World Tourism Industry. Palace on Wheels was nominated for this respected award. This was a milestone in the awards journey of the Palace on Wheels. Nevertheless, this amazing luxury train has won several awards from the time of its inception. In 1987, the luxury train was recognized with its first award - PATA Gold Award which was awarded by Pacific Asia Travel Association. Palace on Wheels train has also been voted IV Best Luxury Train in the World in a survey done by Conde Nast, a global travel magazine. In Asia, the Palace on Wheels was voted as the ‘Best in Asia’ in 2009. In the same year, in August, the train got a new look in terms of decor. The refurbished train was re-launched with a new itinerary and cuisine. The Luxury train keeps adding latest services like upgrading internet connections, adding state-of-the-art facilities like Health Spa, etc.